When possible, BAiP offers several other means of assistance to members. BAiP participates in the "Fresh Food for Seniors Program" sponsored by City Council Member Helen Rosenthal and Borough President Gale A. 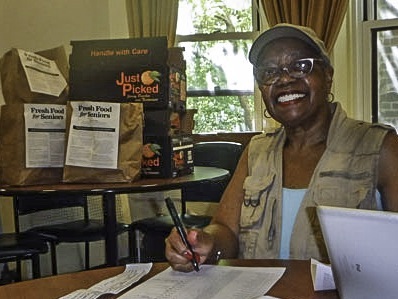 Brewer to bring farm-fresh fruit and vegetables at low cost to seniors on the Upper West Side. In conducting its portion of the program, BAiP has had the generous cooperation of the Addiction Institute at 306 W. 102nd St. as the host for the distribution of food bags to our participants in that program. Seasonal produce bags may contain a selection of items such as corn, tomatoes, squash, lettuce, carrots, potatoes, berries, apples, plums, or pears depending on what's in season every two weeks from June into November. For information, contact us at foodbag@bloominplace.org or (212) 842-8831. Occasionally, BAiP arranges for special one-time trainings. An example of this is a free CPR training for BAiP members run by the New York City Fire Department EMS personnel. When offered, participants are able to practice compressions on a mannequin and review the correct compression techniques. The purpose of the compressions is to maintain blood flow to the brain and heart until an ambulance arrives. Another key component to this training is basic instruction on how to use an automated external defibrillator (AED). Each fall, BAiP communicates with members about the importance of the seasonal flu shot and how to obtain one. Regular-dose vaccine is appropriate for people in good health and under the age of 65. The high-dose vaccine is recommended for people with certain health conditions and for adults over 65. In past years, BAiP has made arrangements for a one-day free flu shot event with a local hospital or pharmacy.